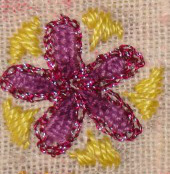 I worked some flowers with woven trellis stitch and other stitches. 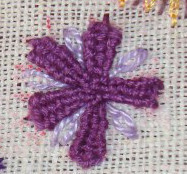 The woven trellis is worked in two shades of violet. 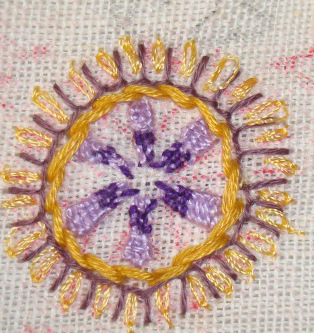 Stem stitch, buttonhole and detached chains are worked in yellow, violet and yellow silk thread respectively. 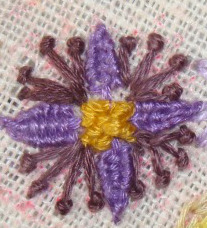 I did not work the detached chains in the centre of this flower properly. 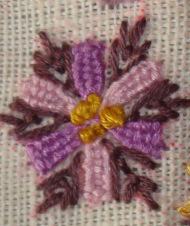 Woven trellis is worked in antique violet and the Vandyke stitches are worked between them in dark violet. 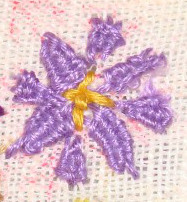 This flower is a combination of woven trellis with long tailed chain in light violet perle thread. The basic idea is, to fill the paisley design with these flowers. 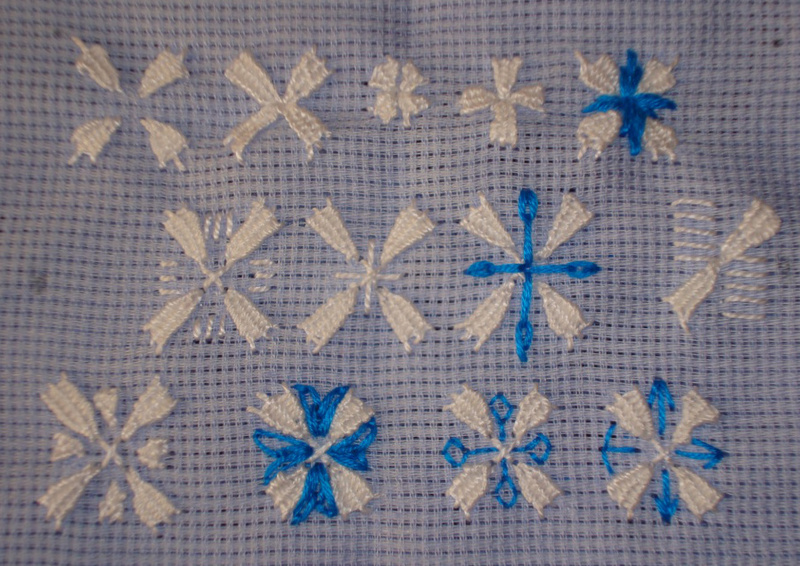 I worked woven trellis stitch has filling stitches in the corner of this piece. 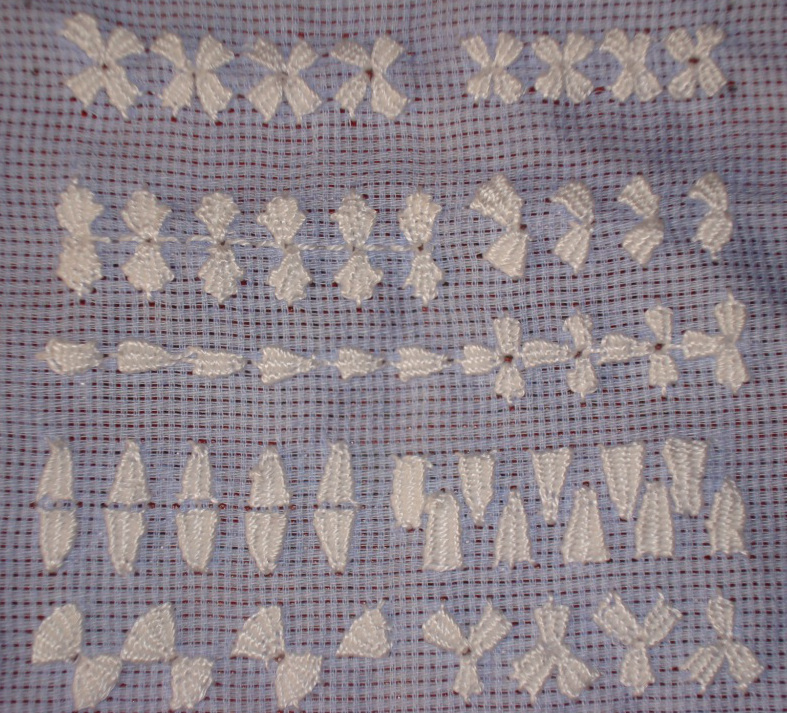 These were done with cotton perle # 8 in two colours. I don’t want to use polyester thread on this piece. So the colours choices are with cotton skeins. 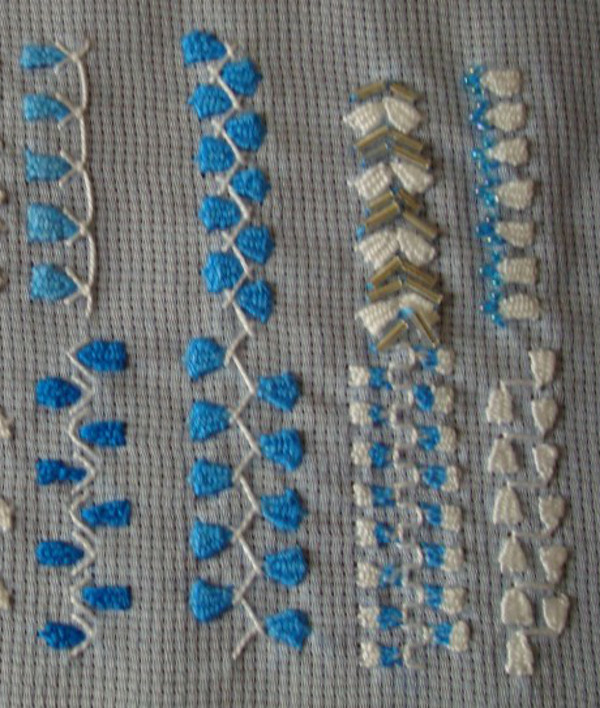 Annet has posted old woven trellis stitch samples. they are wonderful. 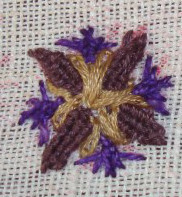 I have settled down on one idea to work the variations of woven trellis stitch this week. It is 6 by 6 inches block. 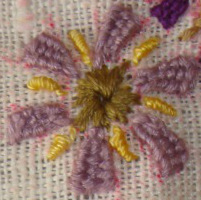 This stitch is to be worked on this piece in this week. I am fond of paisleys, so the main theme is a paisley. I am intending to share my progress on this piece here. I have another tunic project which I need to start, so it may be slow. I started working this stitch on herringbone stitch with straight stitches in between. 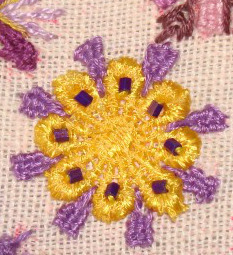 Zigzag chain stitch was worked over this. 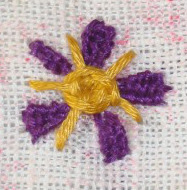 The working of this stitch is on SharonB ’s Pintangle. 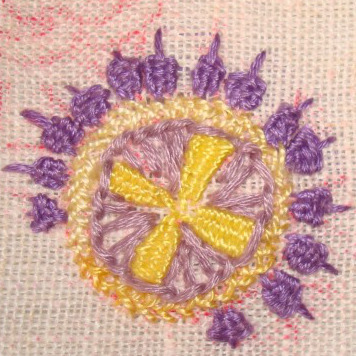 This was the 27th week stitch on TAST 2010 challenge. I had worked the samples but did not post the pictures then. 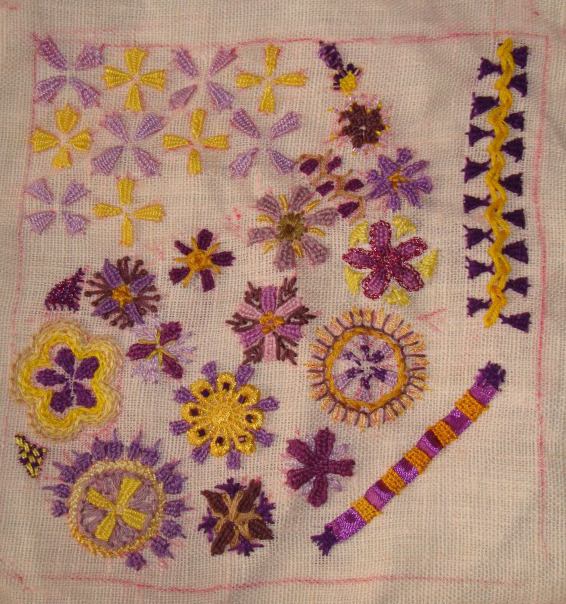 I started with working motifs. 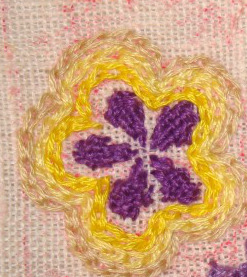 After this, this stitch was worked in lines in this part of the sampler. 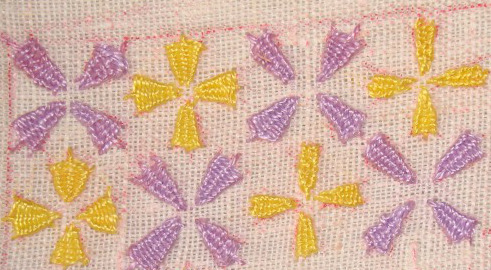 Single stitches, set of two, three and four stitches together were arranged to form these lines. 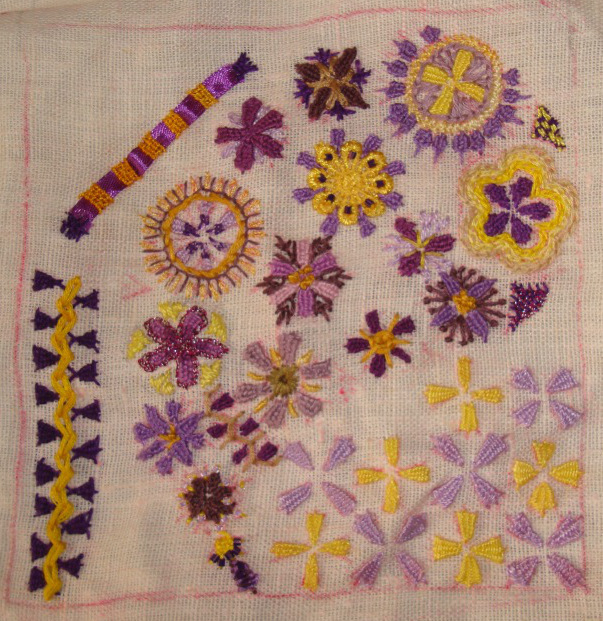 Stitch combinations, beads were worked in this part of the sampler. 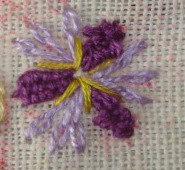 Now I have to start pondering on some ideas of working this stitch on this challenge. Working this stitch does take time.